Congratulations to Hanna Cormick, Prue Stevenson, Kirsty Martinsen, Suzanne Whiteman, Tracksuit and Chelle Destefano, whose submitted artworks were chosen by Arts Access Australia to appear as the feature artworks on our website for 2019. Image description: A mermaid lies on her side with one arm outstretched along the ground above of her head. She wears a gas mask, a neck brace and shells in her hair. The wheels of a wheelchair are in the background. About the artwork: The Mermaid is an artwork by performance artist Hanna Cormick, debuted in 2018, examining disability, rare disease, invisible populations, and our impacts upon the environment. In the ocean, the Mermaid is free. On the land, she cannot swim or breathe, and is vulnerable to pollutions of chemicals, scents and food from human settlement. It is not the Mermaid that is disabled, but the environment that makes her so. The artist uses her real mobility aids, medical devices and uncontrollable disease symptoms, as the structure and choreographic language of the work, recontextualised by the fantasy image of a mermaid. The Mermaid is at once whimsical and confronting, calling into question our notions of inclusivity, body, environment and normalcy. Image description: The image shows biro ink on paper in a graceful 10m long, meditative stim. It appears as one long unbroken line forming small swirls. About the artwork: “Neuroambiguous” is a Biro Ink on Paper, 21cm x ~1000cm, created for the RMIT – First site Gallery ‘Neuroambiguous” exhibition in 2015. A visualisation of the connection between stimming and the autistic brain, Neuroambiguous” is a graceful 10m long meditative stim representing the dense networking of neurological links. 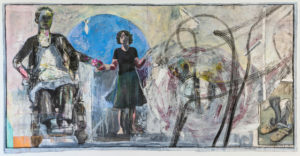 Image description: In Self Portrait 2008-18 a female figure in a flared skirt is gripped by the wrist by a woman in a power wheelchair on one side and on the other side she gestures to a wheelchair tyre print. In the bottom right hand corner, underneath the tyre tracks is a pair of shoes with Ankle Foot Orthotics (AFO) in them. This drawing incorporates almost every stage of my ambulant decline, featuring elements of me from 2008 and before; It was my practice to paint a quick 1 hour Self Portrait when I arrived to the studio in the morning and the standing figure is one of those; a self portrait in a wheelchair from 2015 is drawn in charcoal on recycled watercolours and drawings; the AFO”s I wore up til 2012, and the tyre print is from my wheelchair tyres of 2018. About the artwork: The work was created for the exhibition Have You Tried Yoga? that Kirsty Martinsen curated to accompany Rachel Edmonds’ performance about ableism, also called Have You Tried Yoga, during the Adelaide Fringe Festival in 2018. Following the Adelaide Fringe exhibition, the drawing hung at the Royal Adelaide Hospital as part of Kirsty Martinsen’s Hindsight exhibition, from 24 November 2018 to 24 January 2019. Image description: A mix of seven dancers move forward in a single file line as they exit the stage. They are connected together by their arms and wear white with black scarfs. About the artwork: This image taken at the Little Dragons “Cack Concert” held Sunday 16 December 2018 at Alstonville Dance Studio in Northern NSW. Over thirty Little Dragons performers with varying disabilities performed in the concert, integrating with teenage and adult performers and indigenous musicians without disabilities. This piece was developed in a series of integrated creative play workshops where Dragon dancers were “partnered” with dancers without disabilities using scarfs as a creative tool. The improvised movements created in these workshops led to this performance piece. Little Dragons is a non-funded Dance, Drama, Music and Creative Arts group for people living with disabilities. It is an inclusive community group where all ages and abilities are welcome. Little Dragons operates under the direction of Suzanne Whiteman of Alstonville Dance Studio in the Northern Rivers of NSW. Image description: A man performs on stage, his two hands are set into claws and face each other as if they are the jaws of a dragon. Behind him, a huge snakeskin artwork appears on a screen. About the artwork: This image is from a contemporary dance performance that was created and performed in 2013, and which premiered at State Theatre Centre WA. Image description: sixteen people of different ages, genders, race and appearance dance on stage. 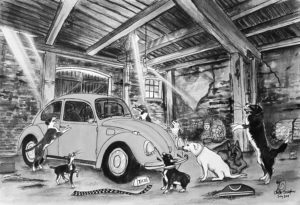 Image description: Taxi Bug the loveable vdub car is sitting in an old rusty shed, sleeping and there are 8 dogs surrounding Taxi Bug, and some are barking at him to wake up as they know he is taking them out for the day to the flower fields and they are excited. It is early morning, and the early morning sun is shining in the cracks of the roof on the far left of the shed next to the big door that is closed and two other cracks in the middle of the shed’s roof is shining in some of the morning sun. The roof is wooden and has beams across the shed. One side of the wall is peeling and showing some brickwork. One of the dogs is licking the bug car’s nose. Taxi Bug’s line of squares decore that usually goes on his sides is laying on the ground, waiting to be dressed onto Taxi. Taxi’s sign is also sitting on the ground waiting to go on his head and his red work bag with white stripe sits on the floor along with a couple of tools. A stack of hay sits in the far right back wall, and a rat is peeking out from behind the hay stack. A window on the far back right of the shed lets in some light and a bit of greenery is showing from outside, and the window is an old antique type with lots of squares in it. About the artwork: Taxi the bug is a well-known character in Chelle Destefano’s artworks and he is featured as the main star and has stories to tell. A cute, hapless little yellow bug, he is much loved by audiences all over Australia and the world. The artwork tells the story of a promise Taxi has made to his dogs. He has promised to take them out into the flower fields for Easter, and the dogs are very excited. The work shows the dogs waking up as the sun dawn and shines through the cracks of the rustic old shed. They bark in excitement and for Taxi to wake up – they are in a hurry to start the day and enjoy the fields with their beloved owner.